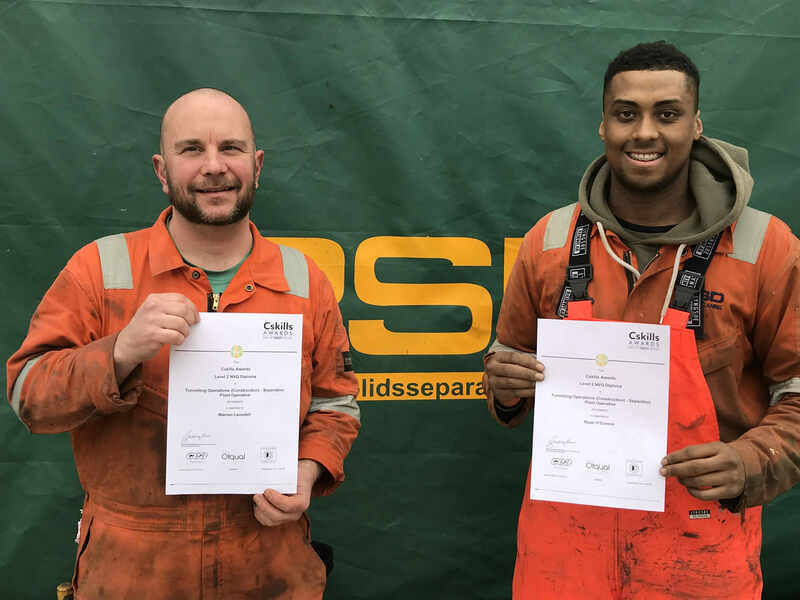 With the introduction of a National Vocational Qualification (NVQ) in Separation Plant Operation, PSD is one of the first companies in the UK to train two of their recent recruits, Warren Lansdell and Ryan O'Connor, to achieve this new standard. The NVQ assessments were completed over a number of months and covered developing and being assessed in a wide range of skills and procedures. Topics covered included health and safety at work, both in PSD's UK Plant Yard and on construction sites, the safe and effective setting up, operation, maintenance and dismantling of a wide range of specialist separation equipment, together with awareness of and care with environmental issues. PSD was complimented by the lead assessor for the standard of training that the company had provided and the level of awareness of health and safety at work amongst the staff. The assessor was also very impressed by the amount of work that both candidates undertook to complete their NVQs. After further site based training from PSD's experienced separation plant operators, it is expected that Warren and Ryan will be ready to take on their own projects.